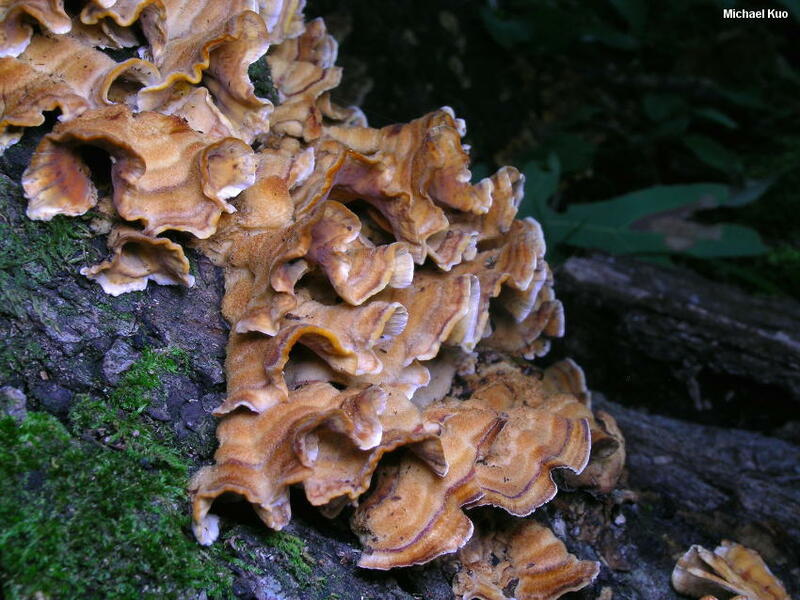 For those who think "Stereum" (off-) rhymes with "tedium" for a reason, Stereum gausapatum may be the exception. Yes, it is yet another dull-colored crust fungus that looks rather like a polypore from above but has a smooth and boring undersurface . . . and yes, it is virtually indistinguishable from Stereum hirsutum--until you scratch its undersurface with your fingernail, whereupon it "bleeds" a dark red latex and thrills young and old alike. Well, maybe not. But the bleeding does make it a little more interesting. 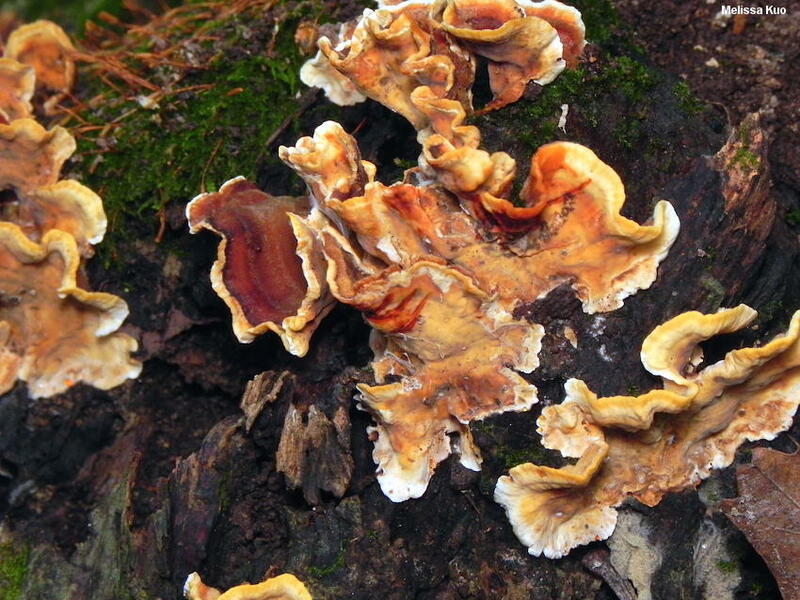 Stereum gausapatum is apparently limited to association with the deadwood of oaks, which helps to separate it from our continent's other "bleeder," Stereum sanguinolentum, which decomposes the deadwood of conifers. 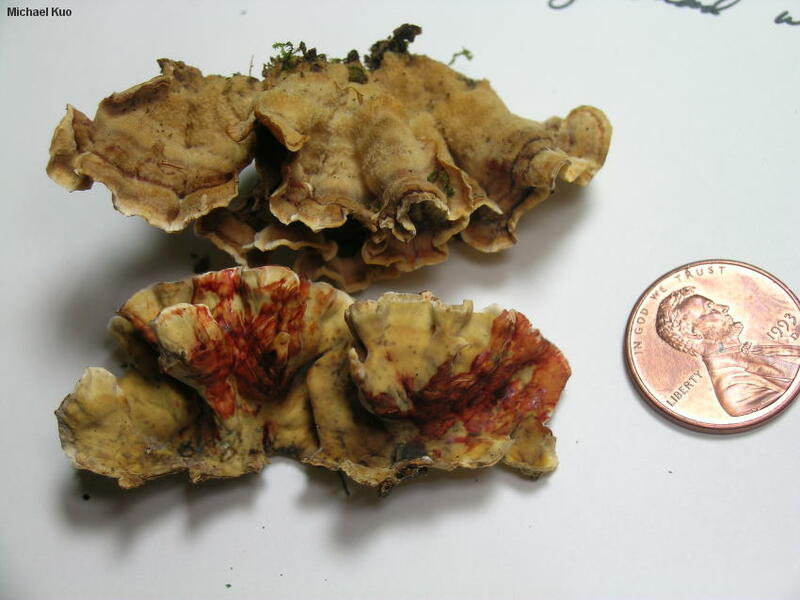 Dried-up, non-bleeding specimens of Stereum gausapatum must be separated from oak-associated Stereum hirsutum specimens with microscopic analysis; the latter has thicker pseudocystidial walls, generally measuring more than 2 µ.
Ecology: Saprobic on the deadwood of oaks; growing densely gregariously, often from gaps in the bark; causing a white rot of the heartwood; annual; spring, summer, fall, and winter; widely distributed in North America. The illustrated and described collections are from Illinois. Fruiting Body: Sometimes resupinate or effused-reflexed, but usually creating fairly well-defined caps that grow in shelving clusters and often fuse laterally. 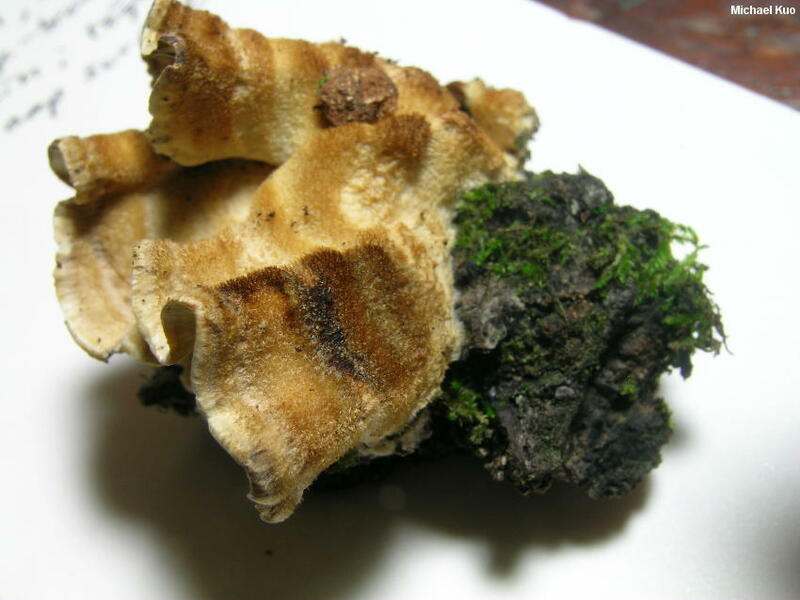 Individual Caps: 2-6 cm across; 2-3 cm deep; thin; dry; with zones of color and texture; fuzzy; golden brown, brown, beige, and yellowish; often with a whitish margin; without a stem; the margin becoming curled and scalloped. Undersurface: Bald; orange-brown to yellow-brown or yellow; with vague color zones; dark red where scratched. Flesh: Tough; thin; whitish to pale brownish, with a narrow brownish zone below the cap surface. Chemical Reactions: KOH negative on flesh and undersurface; negative or blackish on cap surface. Microscopic Features: Spores 5-7 x 2-3 µ; smooth; cylindric; amyloid. Hyphidia cylindric; thin-walled. Pseudocystidia cylindric; walls 0.5-1.5 µ thick; with brownish contents. Clamp connections absent. REFERENCES: (Fries, 1828) Fries, 1874. (Saccardo, 1888; Welden, 1971; Chamuris, 1985a; Chamuris, 1985b; Chamuris, 1988; Binion et al., 2008.) Herb. Kuo 09231202, 09061402. 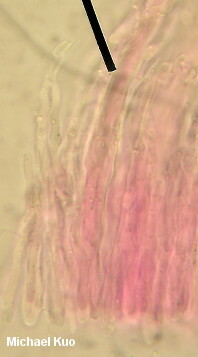 Cross-section of hymenium: pointer indicates walls of pseudocystidia.